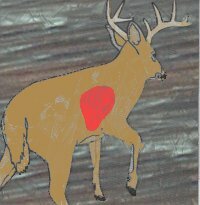 Quartering Toward (steep angle): About 55 percent of the heart-lung area is exposed, but is protected by the shoulder bone. The deer would probably see you move to prepare for the shot. Away (steep angle): About 55 percent of the heart-lung area is exposed. Aim along an imaginary line exiting low on the far shoulder. In this position the deer is not likely to see your movement. 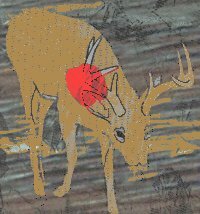 Broadside (ground shot): With 100 percent of the heart-lung area exposed, you have a target roughly the size of an 8 inch paper plate with room for error. By far the best shot to hope for. Toward (ground shot): About 65 percent of the heart-lung area is exposed. Aim for the near shoulder. Don't try this shot with a bow; you'll hit the shoulder bone. Quartering Away (ground shot): About 60 percent of the heart-lung area is exposed. 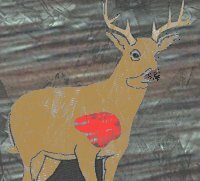 Aim along an imaginary line through the deer's far shoulder. On (ground shot): Only 35 percent of the heart-lung area is exposed, this shot is too risky for archers. Gun hunters should also avoid this shot. 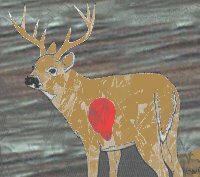 You risk the bullet deflecting off the shoulder bone and only wounding the deer. Wait for a better shot! Know your target! 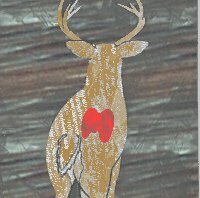 Shoot only after you have verified that it is a deer! Don't Shoot at Sound or Movement. Verify Your Target!